Dit fantastische 2 slaapkamer herenhuis ligt in het hart van het toeristische gebied van Coral Bay. Compleet met nieuwe keuken, badkamer en buitenruimte. Gelegen op slechts 200 meter van de helderblauwe Middellandse Zee. Een paar minuten lopen naar alle bars en restaurants op de belangrijkste strip dus echt geen auto nodig uitstekend uitzicht op zee met uitzicht op de volwassen aangelegde tuinen en mooi zwembad, restaurant en tennisbanen. Het is gelegen in de belangrijkste toeristische gebied van Coral Bay, op slechts een paar honderd meter van de belangrijkste toeristische restaurants, bars, cafés, winkels en nachtclubs. De blauwe vlag zandstranden van Coral Bay zijn slechts een korte loopafstand en biedt alle watersporten. Het profiteert van Wifi Internet, de Britse tv-kanalen, films en tv-series on Demand voor u om te genieten op het "Flat Screen TV. 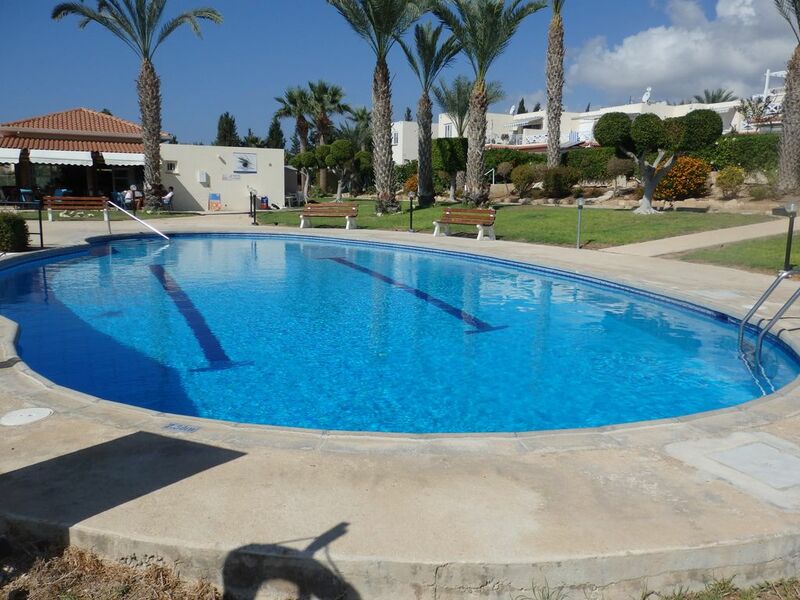 We have just spent 10 nights at this charming town house in Coral Bay. From the moment of booking with Lisa and Felix to landing back in the UK there was not one problem. A taxi was booked for us to and from the airport and on arrival at the house, a lovely welcome pack was waiting for us - this was especially appreciated as it was quite late when we got there. The house was spotlessly clean with a newly installed kitchen and shower room as well. Every appliance you could imagine was available in the kitchen so cooking meals was a dream when we didn't go out. It's great not to have to get dressed up some evenings but just to relax with a drink on the balcony! For information for sun worshippers, the balcony and newly paved small rear garden gets the sun all day. The air conditioning worked as advised in the welcome pack - in a matter of minutes the rooms were cool. The pack provided by Lisa and Felix gives a host of information not only about the house but also about the surrounding area, the restaurants we could get discounts at, trips to do, bus information etc - you could not go wrong. The house was situated a few minutes walk into the Coral Bay strip along a paved and well lit path and being those few minutes away from the centre meant completely quiet nights - heaven. The 615 bus runs directly into Paphos Harbour from here with a very regular service at 1.5 euros a trip. The Wi-Fi and TV in the house were welcome additions also. The pool was spotlessly clean but we didn't use it on this occasion but can imagine it being a godsend in the hot summer months. You can also walk down some steps to the sea and sit on the rocks but the two main beaches are very close by and very walkable to. I have booked through Lisa and Felix many times over the past few years and there has never once been a problem. Emails are answered quickly and Felix is always on hand should there be any technical problems (like me not being able to use the TV - again!). When else am I supposed to catch up on Victoria! The large supermarket offers just about everything you need (it also has fresh fish, meat and deli counters) and also gives you a lift back to your villa free of charge - what's not to like about that? Highly recommended for a wonderful holiday on a wonderful island in the sun. We will be back again in a few months. Enjoy! Stayed here for 3 weeks in March. Easy to find and the key code worked well. The welcome pack we received was the best we've ever had including tea coffee cheese ham butter bread milk water. The sunbathing patio is wonderful on the lower level as is the view across the palm trees 🌴 to the sea from the balcony. Both get the sun ☀️ all day. The kitchen is newly fitted and very well equipped with everything you'd need to cook at home if you so desired. The bedrooms are large with comfortable beds. The newly fitted walk in shower 🚿 is nice but sadly the water pressure is very low. The fact that it has UK TV + new films to watch if the weather is bad or you fancy an evening in was great. All in all I would recommend this townhouse 🏡 to anyone. This town house is in a great location being only a short walk to the main strip in Coral Bay but far enough back to not be disturbed by noise. Just opposite the house is a well lit, paved walkway up to the strip where there are very good restaurants. The apartment was very clean. We enjoyed very good meals at Andria; Sala Thai and Trattoria La Vigna and the Savvas Grill a in Peyia a little further away. Access to the buses to Paphos was good (and the fare of 1.5 euros per journey very reasonable). Because you board the bus at only the 2nd stop we always got a seat (the buses were very busy and often went straight past stops later on the route). The town house has everything you need and the balcony shade and air conditioning was welcome as it was very hot in October. The owners have plans to create a sun terrace on the ground floor garden which would be very welcome. The owners have supplied light weight chairs to take to the pool but it is a shame there are no sun loungers around the pool and the restaurant by the pool is still shut, hopefully this will re-open in 2019.
we are so glad you had a great stay with us, your favourite restaurants are the same as ours! its great for future guests to hear about what a great location it is and how good the facilities are. work is underway this week with the enclosed ground floor garden area , this will provide a spacious sun bathing area and barbecue area. and a new kitchen is currently going in so lots of new great improvements for 2019 season. its lovely for future guest to hear about the villa being well equipped, good outside space and fab location . so glad you enjoyed the welcome pack, we feel this helps guests settle on esp on evening arrivals so they dont have to go off shopping on arrival. Arrived late at night to find a welcome pack left for us off Lisa and Felix which was fantastic and much appreciated. The house is brilliant and so big it could have easily fitted another 3 people in. The balcony is wonderful and I enjoyed getting the sun all day on this. T|he house was spotless and had everything we needed for our holiday and more, really couldn't find fault with anything. My son loved the WIFI and the TV with English channels was brilliant. The complex itself is really lovely and well looked after and the pool area was very nice too. It is a fantastic location and easy walking distance from the main bar street, Phillipos supermarket and Coral Bay beach which was so lovely. Thank you Lisa and Felix and we look forward to returning in the future for another amazing holiday. Its lovely for them to read how spacious it is and the villa spotlessly clean and the complex itself. glad you enjoyed the welcome pack we hope we put everything in to start everyone off either way breakfast or late night snack! Thoroughly enjoyed my stay in Coral Bay. Only one criticism, the shower is not powerful enough.